A visualisation of the data used in Dr Aslanyan's research. One of the most common problems in all areas of science is estimating the parameters of theoretical models using experimental data. For complex models with many parameters this problem can be computationally intensive. Dr Grigor Aslanyan and his colleagues from the Physics department at the University of Auckland have developed a machine learning algorithm that can greatly reduce the computational power required. They tested their algorithm on the standard cosmological model – more commonly known as the Big Bang theory. The figure above demonstrates the efficiency of the algorithm for cosmological parameter estimation. The horizontal axis shows the total number of likelihood calculations, and the vertical axis shows the ratio of the number of emulated calculations (fast) to the number of exact calculations (slow). The algorithm was run in parallel on multiple nodes, and the different colors in the plot show the results for different nodes. 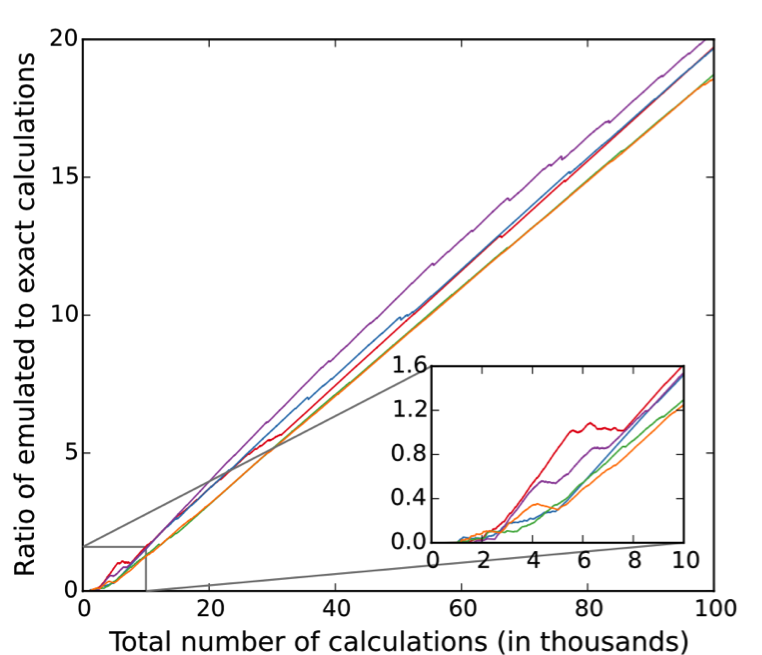 As can be seen in the plot, at the beginning of the run the ratio of emulated to exact calculations is 0 and grows slowly, since the algorithm needs some exact calculations to train itself. However, shortly after starting the scan, the ratio starts increasing, reaching about 20 by the end of the run. This means that the algorithm was able to eliminate about 95% of the required slow likelihood calculations, replacing them with very fast and accurate approximations. This resulted in an overall factor of 6.5 speedup, finishing the run in a few hours instead of about two days. Dr Aslanyan’s work was published in JCAP 09 (2015) 005. The paper is also available on arXiv, 1506.01079. The algorithm has been implemented in C++ and is publicly available as a part of the Cosmo++ package at http://cosmo.grigoraslanyan.com.